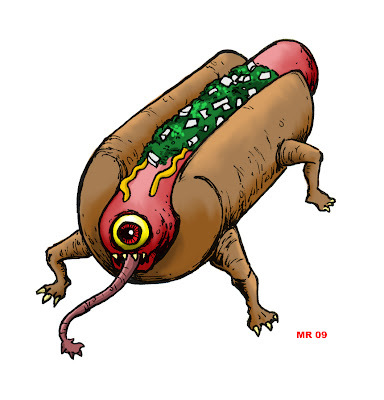 A monstrosity birthed from the disgusting unsanitary conditions in an ordinary hot dog factory. You know, we know enough now about the ingredients in these things that you probably shouldn't eat them, even if they don't have legs and aren't trying to kill you. The Ultimate Console Database: Pics and info on every video game system ever made. Hawanja's Etsy Store: Come by often and buy lots of stuff! Why I hate the World: Angry, partisan filled rants with lots of F-words. Enjoy! Hawanja on Deviant art: Please give me honest feedback. I am a grown man now. I can take it.